JH OMEA Solo & Ens. POB collects all individual funds, then submits one group payment to OMEA. ​Once registration is complete, OMEA fees are non-refundable. Checks should be made payable to "POB". ​Download and print the invoice below. Then submit payment along with invoice to your student's orchestra directors, either Mrs. Cranston or Mr. Barrett. If student is submitting more than one entry, please pay per piece by clicking on the drop down menu in the white box under "Solo & Ensemble Fees" along with requested information, then click "Add to Cart"
​From the Shopping Cart page, click the blue "Continue Shopping" button at the top right corner. Repeat as needed. 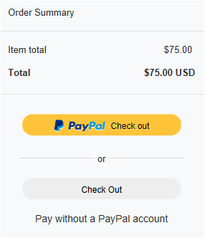 Do I have to have a PayPal account to pay with a credit card online?